Members of the Five Points Gang of New York City. 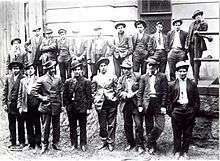 Five Points Gang was a 19th-century and early 20th-century criminal organization, primarily of Irish-American origins, based in the Sixth Ward (The Five Points) of Manhattan, New York City. 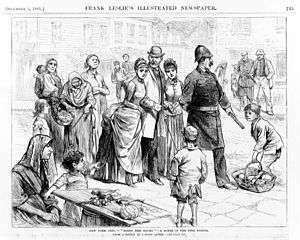 In the early 19th century, the area was first known for gangs of Irish immigrants. Their descendants gradually moved out, to be followed by the next immigrants. Paul Kelly, born as Paolo Antonio Vaccarelli, was an Italian American who founded the Five Points Gang, one of the dominant street gangs in the first two decades of the twentieth century. Over the years, Kelly recruited youths who later became prominent criminals, such as Johnny Torrio, Al Capone and Lucky Luciano. The area of Manhattan where four streets – Anthony (now Worth), Cross (now Mosco), Orange (now Baxter), and Little Water (now nonexistent) – converged was known as "The Five Points". Mulberry, notorious for slum tenements, was one street down from the Five Points. This area, now the location of Chinatown, lay between Broadway and the Bowery. By the 1820s, this district had been a center of settlement for poor immigrants and was considered a "slum" area. Gambling dens and brothels were numerous in the Five Points area, and it was considered a dangerous destination, where many people had been mugged, particularly at night. In 1842, Charles Dickens visited the area and was appalled at the poor living conditions in substandard housing. By the 1870s a wave of Italian and Eastern European Jewish immigrants were settling into the area. Criminal gangs competed for control of the revenue to be made from illicit activities. Irish gangs, such as the Whyos, replaced the Chichesters. Monk Eastman's Eastman Coin Collectors had many Irish members. The 2002 film, "Gangs of New York", is set in Five Points. The Italian immigrant Paul Kelly (born Paolo Antonio Vaccarelli), formed the Five Points Gang, made up mostly of Italians. During the gang's later years, Kelly's second-in-command John Torrio, helped form a national crime syndicate in the United States. The Five Points Gang had a reputation for brutality, and in battles with rival gangs, they often fought to the death. Kelly and Torrio recruited members from other gangs in New York to join the Five Points organization. Al Capone came from the James Street gang, and would later lead the Chicago Outfit. Torrio was the first to establish his style of racketeering in Chicago, and recruited Capone to join him there. Charles "Lucky" Luciano, also joined the Five Points crew, and was later considered the most powerful criminal in the country. Biff Ellison, a former member and would-be leader of the Five Points Gang. As the Five Points Gang became more experienced, Kelly and his lieutenants saw the money to be made by supporting corrupt politicians in their election bids. By threatening voters, falsifying voter lists and stuffing ballot boxes, the gang aided city officials of the Tammany Hall era to retain power. At the turn of the 20th century, the only competitors to the Five Pointers were from Monk Eastman's gang. The rivals disputed claims to a strip of territory of the Lower East Side in Manhattan. In 1901 a Five Pointer shot Eastman in the stomach, but he survived. Soon after, one of his crew killed a Five Pointer in retaliation. By 1903 the feud escalated, and the two gangs openly engaged in warfare. In one incident Kelly, Torrio and 50 Five Pointers were in a gun battle with a similarly sized force of Eastman's gang. Police called to the scene had to retreat from the battle, which lasted several hours. Three men were killed, and many were wounded in the battle. When the police finally gained control of the situation, they arrested Eastman, but he spent only a few hours in jail. A Tammany-controlled judge released him after Eastman swore that he was innocent. The general public was angered about warfare in the streets. A Tammany Hall deputy named Tom Foley brought Kelly and Eastman together and told them that neither would receive any political protection if they did not resolve the border dispute. They restored peace for a short time, but within two months, violence had risen again. Officials brought together the two leaders but asked them to take on each other in a boxing match, with the winner's gang to take the disputed territory. The New Brighton/Little Naples Cafe, main clubhouse of Paul Kelly's Five Pointers. On the appointed day, hundreds of men from both sides met at an abandoned house in the Bronx. Eastman and Kelly fought each other for two hours. Kelly had been a boxer in his younger days, and was said to make a better showing in the earlier rounds, but Eastman was a larger man and fought ferociously. At the end of the match, neither man had been knocked out, and the match was declared a draw. The gang leaders told their men that they were still at war. At this point, the Tammany Hall bosses decided to back the Five Points crew, and to withdraw any legal or political help to Eastman and his gang. In 1904 Eastman was beaten unconscious by a policeman who had foiled a robbery in progress. Eastman was convicted of the crime and sentenced to a 10-year term in Sing Sing. His successor Max "Kid Twist" Zwerbach was murdered in 1908 by members of the Five Points Gang, and the Eastman crew began to crumble. Paolo Vaccarelli/Paul Kelly survived an attempt on his life, after being shot three times by two of his lieutenants, James T. "Biff" Ellison and Pat "Razor" Riley, in a gun battle inside one of his nightclubs. Tammany Hall pressure made him keep a lower profile after this incident. He became more involved in the nascent labor union rackets. He died of natural causes in 1936. Gradually the Mafia gangs took over the rackets and criminal activities formerly controlled by the Five Points Gang. Former Five Pointers such as Torrio, Capone and Luciano became the leaders of the new groups, and expanded their operations on a national and international basis. With the 18th Amendment and the Volstead Act establishing Prohibition in 1920, profits from bootlegged liquor became a huge source of revenue for the Mafia families.